Until a few years ago, the Standard Model of particle physics had sixteen particles verified. Recently, the Higgs Boson was added, so just imagine another triangle hanging off somewhere. Or, alternately, one may combine the Z and W Bosons when adding the Higgs, so a sixteen-fold scheme is maintained. 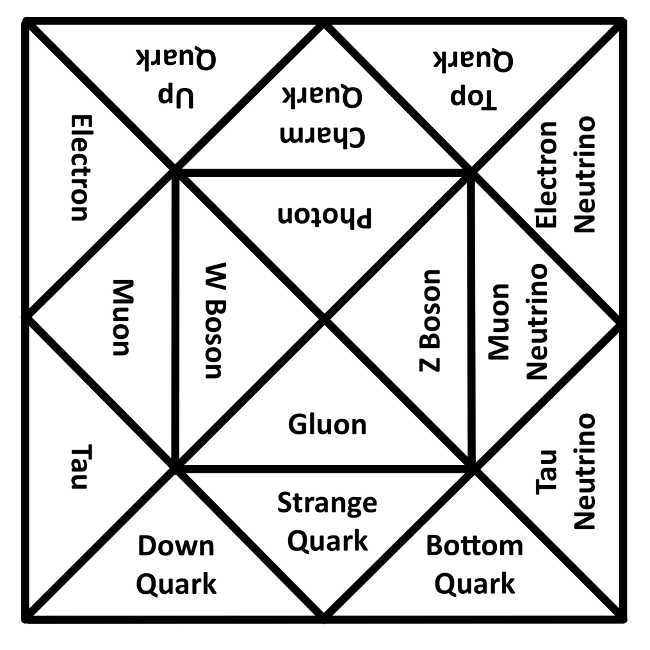 Also, the Standard Model is much more than a list of these seventeen particles and their attributes. Not shown are a plethora of equations that describe the properties of these entities and their interactions. I admit that this diagram is not very useful for scientific knowledge, but the reader may contemplate it as they please. This entry was posted on September 5, 2018 at 11:46 AM and is filed under fourfolds, Physics, sixteenfolds. You can follow any responses to this entry through the RSS 2.0 feed. You can leave a response, or trackback from your own site.